Some lovely face washes for you – I’ve had these on the side of my sink for the past month or so and have been using them on rotation. Usually for my morning cleanse, because I do like to save the more luxurious routine with a thick cleansing balm and a “hot cloth” for the evenings. It helps me to wind down and forget about the day’s troubles! The morning cleanse is different – it has to have something a bit more splashy and dynamic about it so that I don’t fall back to sleep, and it has to be relatively quick and easy. If there’s any excuse to faff in the morning, I’ll take it; if I started a full-on cleanse with a balm and a cloth after breakfast then I’ve no doubt that I’d still be doing my ablutions at lunchtime. The types of cleansers that I go for in the mornings tend to have a light gel texture and a fresh feel but they are never – never! – stripping or drying. Even if you have very oily skin, you don’t want to be drying it out with your cleanser – tight, stripped skin is bad news. It might feel better than oily skin, if you’re desperate not to have oily skin, but it’s actually just skin that’s sad and vulnerable because it’s been deprived of all of its natural oils. The key is to find cleansers that are effective but gentle – good at breaking down dirt and makeup and sunscreens, but also good at leaving the skin comfortable and with its natural defences in tact! 1) JASON Super-C Cleanser, £10.29 from FeelUnique.com: this one is a very jazzy morning option. Orangey, a little zingy, it does a good job of cleansing and freshening, though it needed a couple of attempts when it came to removing the full, troweled-on made-up face. 2) Goldfaden MD Pure Start Cleanser, £32 from Space NK: this one is so, so gentle. 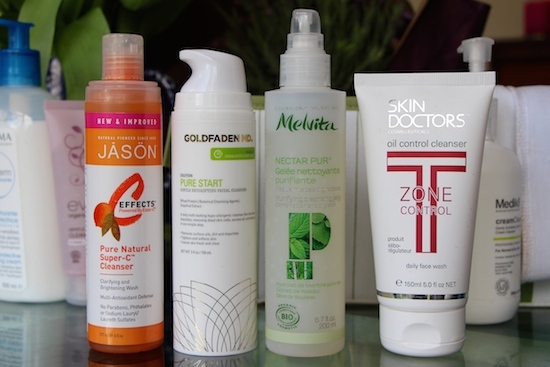 Goldfaden MD is a relatively new discovery for me, and I have only tried the cleanser so far, but I like what I see. 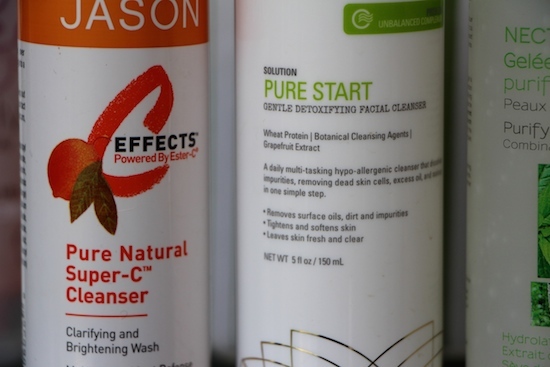 This is a brilliant “PMT cleanser” – fresh, non-aggravating washing for skin that’s raw and angry and threatening to break out into pustules at any moment. 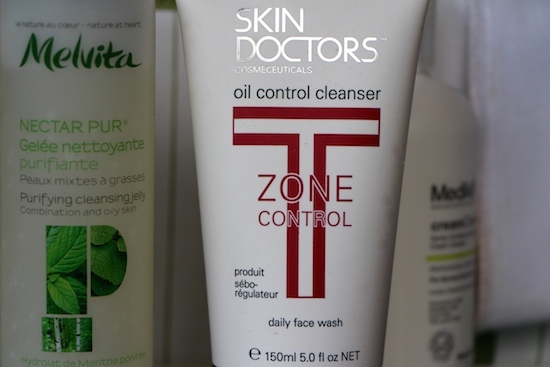 4) Skin Doctors Oil Control Cleanser, £11.20 from LookFantastic.com: another brilliant “PMT cleanser”. This one specifically targets excess oil production and helps to keep breakouts under control, but again, there’s no feeling of dryness or tightness after rinsing. A great one if you’re a little spotty but don’t want to resort to the ranges aimed at teen skin. This is for grown-up spot-fighting. All of the cleansers above can be massaged on with fingertips and then splashed off, or you can remove using a washcloth and warm water. I tend to do a bit of splashing, if it’s early in the day, otherwise I use a flannel or, if I’m feeling particularly feisty, a bit of a zoom about with my Clarisonic! Previous Post Dry Touch, Tropical-Scented Sun Protection: This Makes Me Happy!